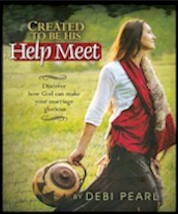 Are you a homeschool evangelist? Are you being obedient to scripture and teaching the next generation the blessings God has given you? 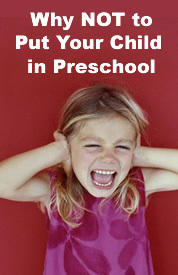 Are you interested in helping your support group or church start a Exploring Homeschooling ministry? Please contact us for an outreach guide and help. 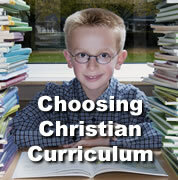 Our ministry is about helping your ministry cultivate the good fruit of homeschool evangelism. If your support group or church already reaches out to young families exploring homeschooling, please list your organization on our Homeschool Search Engine. Below are some useful tools for introducing other Christian families to the blessings of private Biblical homeschooling. Whether you are an individual reaching out to another family, a homeschool support group that is starting reach out to new generation Christian parents, or a Exploring Homeschooling chapter, we hope this monthly News and Tips will help you. God has given us some ideas that work which we want to share, but He has given you some, too. Please email us your ideas, as well as praise reports and prayer requests regarding your outreach. We will also be highlighting an individual or ministry engaging in growing homeschooling in their area, to remind us to pray for one another. Why you should be exploring homeschooling... is an effective homeschool evangelism color, tri-fold tract with encouragement, statistics, and scripture to help Christians make the decision to homeschool. This tract was designed so your support group or church can stamp the back with your contact information. 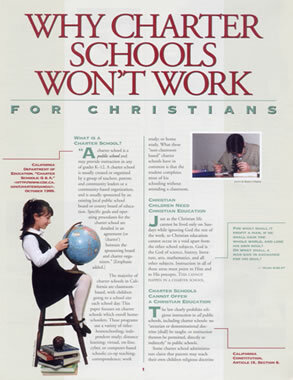 Why Charter Schools Won't Work for Christians is available from CHEA of California, this four page brochure covers the reasons Christians should not join charter schools. This has California specific information, but may be valuable for some other states.